Happy Memorial Day Nosh Show Listeners! Episode 105 is now live and it's all about upcoming treats that JunkBanter and @CandyHunting saw at the 2017 Sweet & Snacks Expo. Several of the items are spicy so you can probably guess how I will vote on those. Give the show a listen, maybe while you are drinking my sip (and nosh) of the week: the returning Chick-fil-A Peach Milkshake and the new smokehouse bbq bacon sandwich. I'll be honest, I didn't have the greatest of expectation when ordering the peach milkshake. 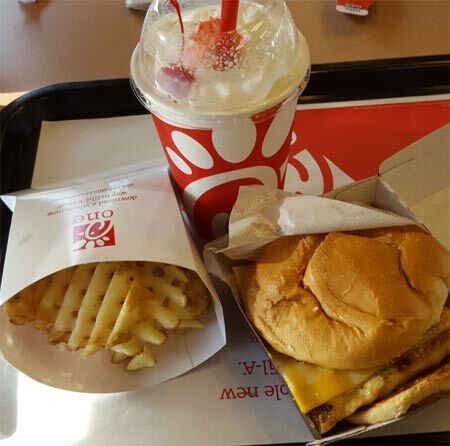 I like Chick-fil-A but I haven't really loved anything on the menu yet, but I will say that the peach shake was really good and went surprisingly well with the chicken sandwich. Their shakes aren't particularly thick, but it had just the right amount of sweetness and peach flavor to be a nice reminder that summer is coming. The only thing that caught me off guard were the actual chunks of peaches coming up through the straw. I could do without those but they weren't a huge hindrance either. This isn't a sandwich blog but I did enjoy the BBQ sandwich. It was my first experience with Chick-fil-A's grilled chicken patty and while not amazing, it was certainly much better than that disaster from McDonalds. The thing that surprised me most was that they didn't drown it in BBQ sauce like a traditional fast food joint. This let all the various pieces still do their thing, and also left room for the peach shake to enhance everything as well. In other words, this was a very enjoyable meal. I still want those waffle fries to be crunchy, but I'm glad we stopped here before catching Guardians of the Galaxy Vol2 (which was very good ofcourse). One last item. 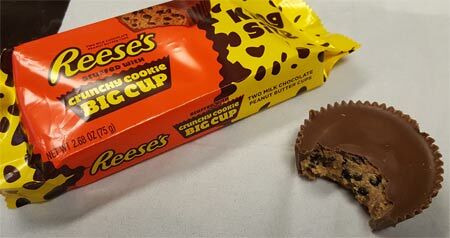 This is the Reese's Crunchy Cookie Big Cup from our Nosh or Not list and we talk about it during the show. Have any of you tried it? I couldn't help but get the thought of a salty peanut butter cookie dough out of my head. It was enjoyable but unexpected.